A traditional local dish of vinegared rice garnished with vinegar-pickled myoga ginger, butterbur, salmon and other ingredients, and then wrapped in myoga leaves. It has traditionally been cooked in the home as a special dish with which to entertain guests on occasions such as memorial services given at home and festivals. 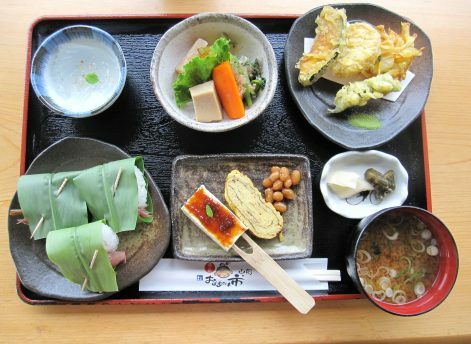 The best season for Myoga is July to October, and so this is a traditional dish enjoyed during summer and autumn. Enjoy the taste and flavor of myoga!